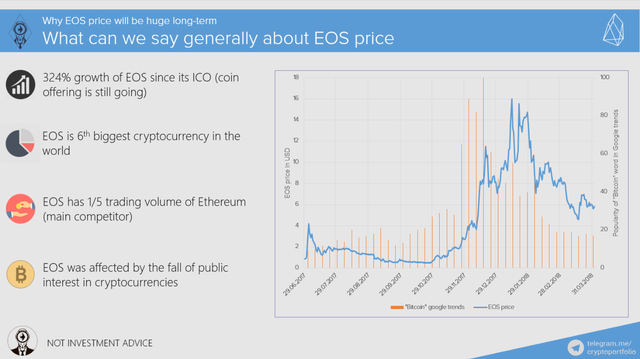 On the right part of the slide, there is a graph which shows the price change of EOS since its ICO (which is still going) and popularity of “bitcoin” in internet search. Why did I bring it up? I simply think it is crucial for us to analyze the recent performance of EOS on digital exchanges. Also, we can compare EOS with other cryptocurrencies. To be honest, for some reason I am very proud of this slide. 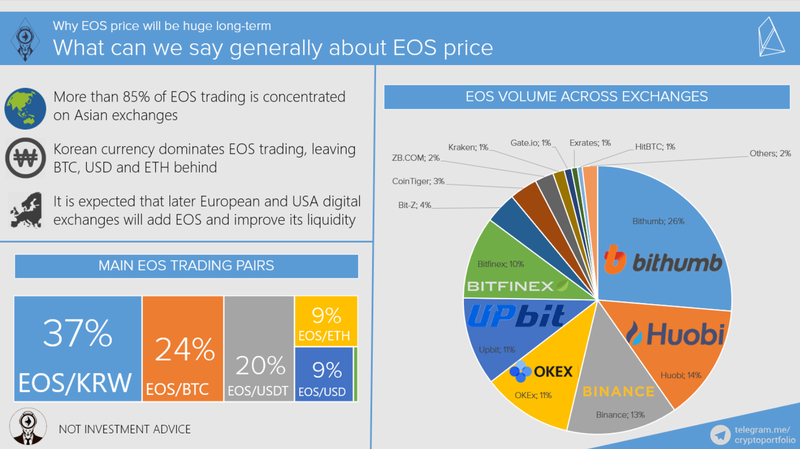 As you can see from the pie chart on the right, more than 85% of all trading of EOS is generated through Asian digital exchanges. Bithumb takes the first place with 26%, Huobi takes 14%, Binance controls 13% of EOS trading, OKEX 11%, UPbit 11%, Bitfinex 10%. USA exchange Kraken occupies only 1% which is extremely low. Do you know the reason why the Asian digital exchanges are in such dominating position? I think that regulation environment in the Asian countries is much more welcoming and less taxing. From the trading pairs perspective, Korean WON is absolute leader in EOS trading volume. Korean currency occupies 37% of all trading, BTC takes the second place with 24%, USDT 20%, ETH 9%, and 9% USD. I am seriously surprised with how Koreans are interested in EOS, they must be the biggest supporters of EOS! I think when EOS goes live in June 2018, there will be more exchanges from Western countries supporting EOS trading. More digital exchanges means more liquidity. 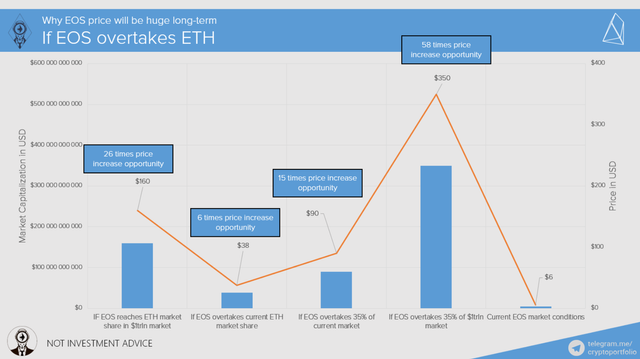 More liquidity means more money into EOS. More money means bigger price. 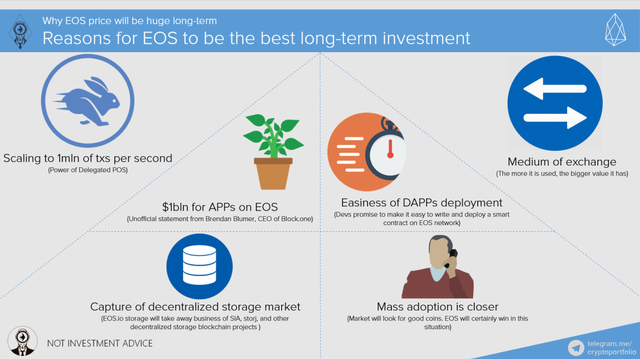 Why will EOS be the best long-term investment? 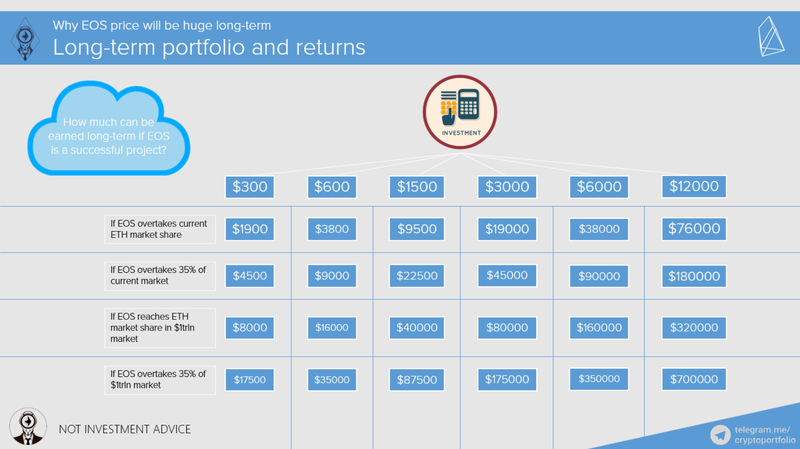 Here I would like to show you all those scenarios affecting portfolios with different amount of EOS tokens. 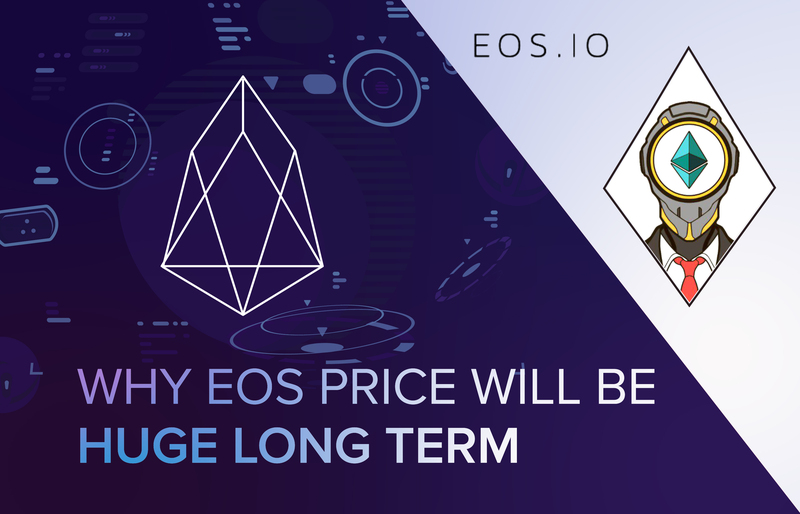 How much can be earned long-term if EOS is a successful project? 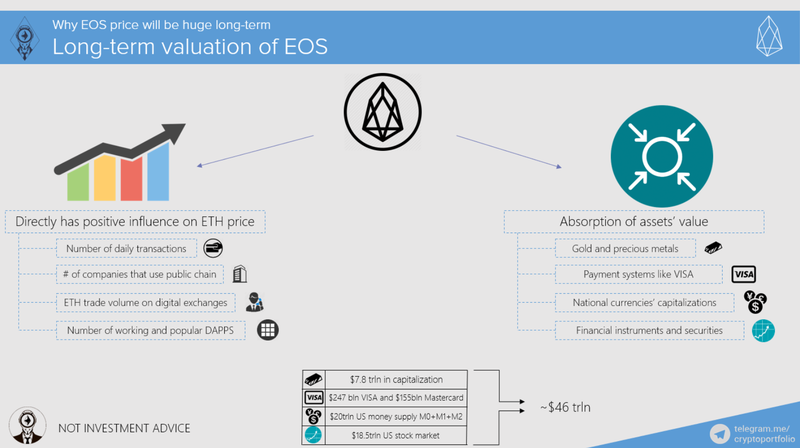 On the top of the slide there are different USD investments in EOS (bought at $6 apiece). $300 EOS portfolio, $600 and so on. As I mentioned numerous times, never perform any financial transactions based on my presentations, always consult with your lawyers and financial advisors. My presentations are educational and my try to analyze the future of cryptocurrency. If you want to learn more about EOS, then do not forget to check my video called “Deep dive into EOS”. Steadily building the platform, Dan Larimar has always presented great confidence during interviews on the EOS project. Definitely, a coin to hold long term. CoinCheckUp.com - on of the best (or even the best) stats, charts, data and analysis of crypto. Price holding strong even as supply diluted by 2 million tokens/day. Looking forward to June 1. ! Sorry @controllinghand, you can't tip yourself! Σ$$$ Tipped @cryptoportfolio Σ10 SMART! Comment @smartbot help to claim. Currently the price of SmartCash in the market is $0.115 USD per SMART. Current value of the tip is $1.15 USD. To find out more about SmartCash, please visit https://smartcash.cc.